It’s been a little quiet on the blog recently. Please do not take this to mean Bierebelle in any way condones or participates in Dryuary. I am just a girl who, like any other normal girl, ate and drank way too much over Christmas (the North of England is always dangerous for this!) and put on a little extra unwanted padding. In an effort to ditch this, it’s been a pretty clean-living regime since the debauchery of New Year. This has meant switching daily mince pies for apples and tangerines and beer has been abandoned for fresh juice and tea. However, I do still recognise that there are occasions when a little tipple is absolutely necessary, for medicinal purposes more than anything. Beer has historically been for many the healthy alternative to dirty water and stouts have a long standing reputation as essential nourishment. Although the clean-living regime seems to have significantly boosted my immune system to the point that I have not contracted any of the foul bugs doing the rounds at the office my poor OH is unfortunately suffering from the mother of all coughs. 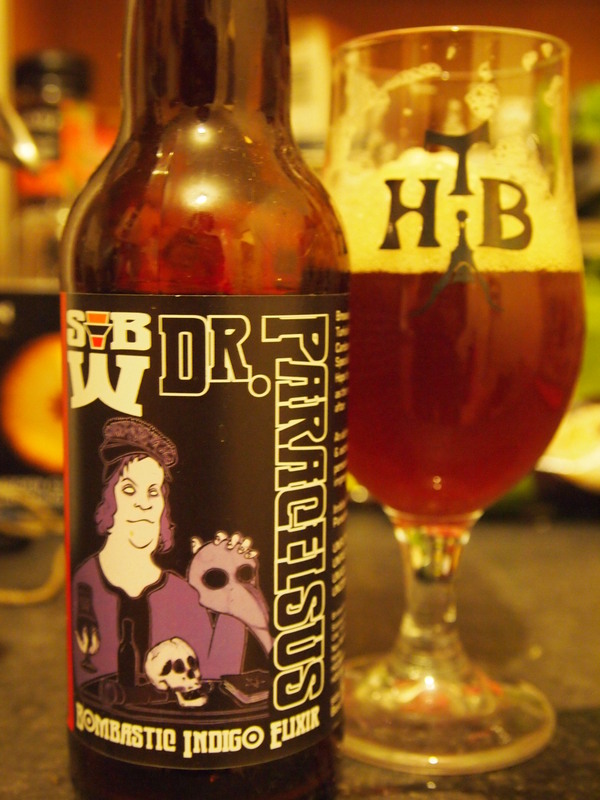 In sympathy, I have used this as an excuse to open the Summer Wine Brewery Dr Paracelsus (8%ABV) Bombastic Indigo Elixir which I had been saving for an emergency such as this. . This mysterious brew was a bit of a devil to pour, cloudy and lively and golden with a spicy coriander leather and tangerine aroma that was reminiscent of a warming exotic cocktail. It may not be medicine, but this concoction was still pretty uplifting. Although it was at first terribly bitter, a spoonful of sugar was not necessary once it had a chance to work its charms. The charismatic blend was an unusual mix of orange peel, coriander, blackberries a touch of liquorice root and black peppercorns at the end. There was definitely something sticky, woody, leathery about it, like a dark, dirty cocktail lounge where measures are poured freestyle and menus stick to the table. It’s not for everybody and it probably won’t make you better, but it might just transport you somewhere a little more interesting for a while. A lovely review! I like the leather/sticky menus thing a lot!